Chicago police tonight have issued a familiar warning: People are being robbed when they show up to sell valuables to strangers whom they’ve met via Craigslist. Friday evening, a man was kicked and punched in the face by two offenders who robbed him of his valuables after meeting up in a CVS Pharmacy parking lot at Irving Park and Western. The offenders are described as two black men in their early 20’s who stand about 5’10” tall and weigh about 150 pounds. They were wearing all black clothing and were last seen running southbound in a nearby alley. About an hour before the CVS incident, another victim was robbed by the same men after meeting up with them in the 3900 block of Lawrence. Chicago police have frequently announced that their stations may be used as safe locations for transactions between strangers. Of course, once you leave the station with your wad of cash or merchandise, you’ll be on your own. 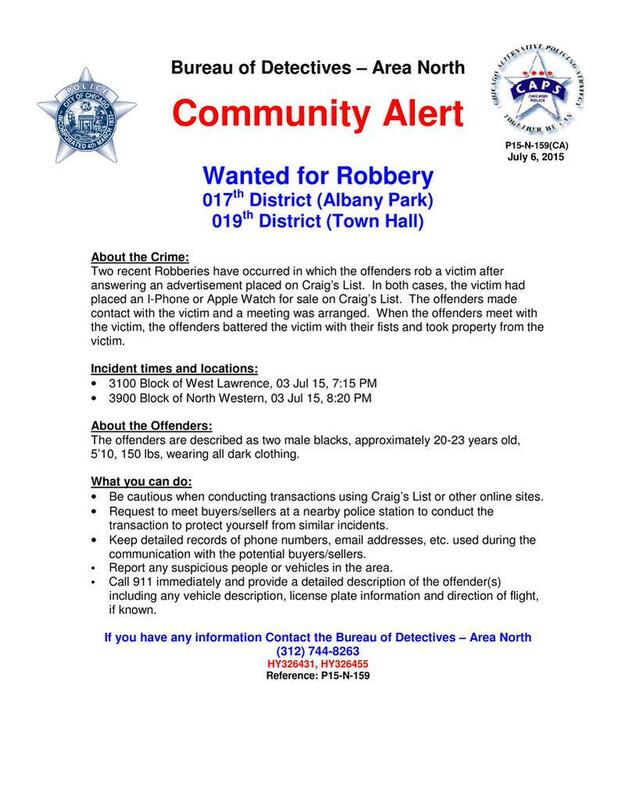 In January, a Logan Square man's bicycle was stolen from the 14th district police station foyer while he went inside to report his iPhone stolen.